TALLAHASSEE, Fla. – Now is not the time to celebrate. Certainly not with a Sweet 16-matchup against Tulsa less than 48 hours away. 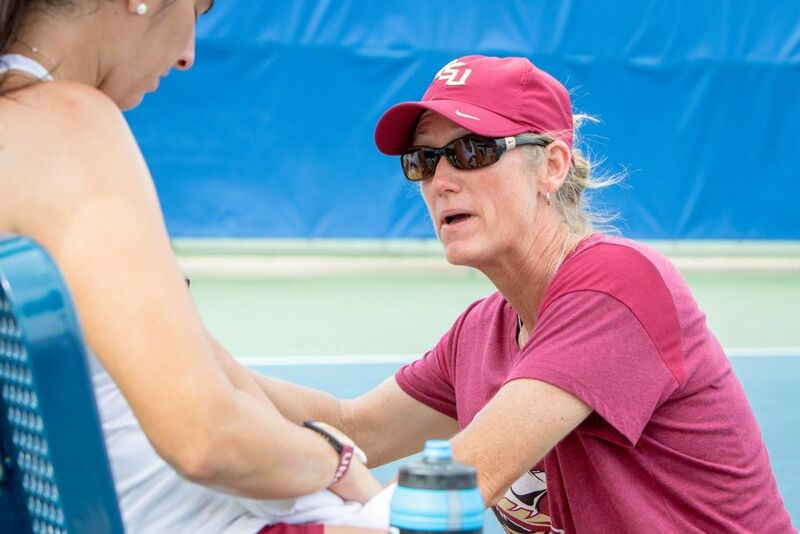 But as her team prepared to play in the second weekend of the NCAA tournament for only the second time in school history, Florida State women’s tennis coach Jennifer Hyde couldn’t help but think back on the road that led the Seminoles to this point. A Florida State graduate and tennis alum, Hyde took over at her alma mater in 2005 and was tasked with guiding a program that had been to the NCAA tournament in seven of the previous eight years but never advanced beyond the Round of 32. It took years to re-lay a foundation, and countless hours spent on the recruiting trail both around the country and the globe. But now in her 14th year at the helm, Hyde and the Seminoles are among the last 16 teams standing with an opportunity to go where no FSU team has before – the Elite Eight. Florida State (20-8) will meet Tulsa (23-5), which upset No. 8-seed Oklahoma State in the second round, Thursday at 4 p.m. in Winston-Salem, N.C. The winner gets a likely date with No. 1 Vanderbilt on Saturday. While it’s true that Florida State has made it to the Sweet 16 once before – FSU beat North Florida and No. 18 South Carolina in 2010 and finished ranked 14thin the country – this time feels different. The Seminoles’ tournament road to this point is a perfect example. In February, FSU picked up one of the biggest wins in program history when it knocked off No. 3 and defending national champion Florida at the USTA’s College MatchDay event in Lake Nona, Fla.
Then, last week, the Seminoles did one better by knocking off the Gators again, this time in Gainesville, to send the champs packing and advance to the next round. Along the way, they also earned victories over ranked opponents Clemson, Wake Forest, Virginia and Syracuse. “It’s never easy to go play at Florida,” Hyde said. “The fact that this team was able to take them down two times in the season – I think the only schools that have been able to do that (ever) are Stanford, Vanderbilt and Georgia. No kidding. Since the first NCAA women’s tennis tournament began in 1982, Stanford, Vanderbilt and Georgia have combined to win 21 of a possible 36 national championships. Florida has added seven more. In fact, only nine schools have ever won a women’s tennis title and seven of them are still in the mix entering this week’s competition. Which makes Florida State one of just nine teams with a chance to join the ranks of the sport’s elite. There’s still a lot of work to be done between now and a national title, but, if there’s one thing Hyde knows for sure, it’s that her team won’t be overwhelmed by the moment. How could it after taking down the defending champions? A lot of desire, too. Elevate a program that hadn’t advanced out of the first weekend of tournament in any of the last three seasons, and make a run to the Sweet 16. There have been hundreds of sets, teammates that have come and gone and all the highs and lows that any team experiences over the course of several seasons. But as her collegiate career nears its end, Castaneda, the team’s only senior, can finally say she achieved that goal.